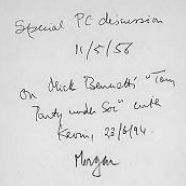 From box CP/CENT/PC/02: FILE 24: Document on re-registration and notes by George Matthews, January 1956. -- FILE 25: Document; notes by George Matthews, February 1956. -- FILE 26: Documents, March-April 1956. -- FILE 27: Documents, including on the CPSU 20th congress; notes by George Matthew, May 1956. -- FILE 28: Documents, including about E.P. Thompson; notes by George Matthews, June 1956. -- FILE 29: Agenda, document on the CPSU 20th congress, July 1956. -- FILE 30: 2 documents on conscription, one on working-class unity; notes of PC discussions with John Saville & E.P. Thompson, August 1956. -- FILE 31: Documents on conscription, and on the British Road to Socialism, September 1956. -- FILE 32: Agenda; documents; James Klugmann's notes, October 1956. -- FILE 33: Document on colonialism, George Matthews' notes, November 1956. -- FILE 34: Document on Hungary; circular; correspondence from Arnold Kettle and Gordon McLennan, December 1956. -- FILE 35: Undated documents; including material on Jewish Committee Conference, 1956. CP/CENT/PC/02/24: Document on re-registration and notes by George Matthews, January 1956. CP/CENT/PC/02/25: Document; notes by George Matthews, February 1956. CP/CENT/PC/02/27: Documents, including on the CPSU 20th congress; notes by George Matthew, May 1956. CP/CENT/PC/02/28: Documents, including about E.P. Thompson; notes by George Matthews, June 1956. CP/CENT/PC/02/29: Agenda, document on the CPSU 20th congress, July 1956. CP/CENT/PC/02/30: 2 documents on conscription, one on working-class unity; notes of PC discussions with John Saville & E.P. Thompson, August 1956. CP/CENT/PC/02/31: Documents on conscription, and on the British Road to Socialism, September 1956. CP/CENT/PC/02/32: Agenda; documents; James Klugmann's notes, October 1956. CP/CENT/PC/02/33: Document on colonialism, George Matthews' notes, November 1956.